With advice for finding, evaluating, and documenting sources, this handy spiral-bound pocket guide covers the essential information college students need for research assignments in more than 30 disciplines. New, up-to-date documentation models guide students as they cite common sources and newer sources in the current editions of one of four documentation styles (MLA, APA, Chicago, and CSE). Advice, examples, and activities help students engage in the research process, find entry points in debates, and develop their authority as researchers. 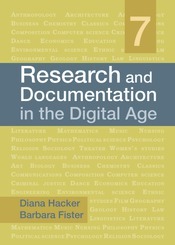 The many examples, according to one college librarian, “are realistic and relevant.” Research and Documentation in the Digital Age is the perfect companion to any college textbook.